Althorpe Island Lighthouse | Lighthouses of Australia Inc. The island’s cultural history most likely began with the Lower Yorke Peninsula inhabitants, the Narungga people, 8000 years before present sea levels rose 120 metres. It was the English, (Matthew Flinders) and French (Baudin & Freycinet) explorers, who sighted the island in 1802 and named their respective discoveries, ‘Althorpe Isles’ and ‘Isles Vauban’. The next known contact on Althorpe Island came in 1838, with the burial of ‘T. Peterson’, a 42 year old sealer, who is believed to have lost his life during one the sealing expeditions, working along on Althorpe Island’s 5 km shoreline. Althorpe Island, is 91.5 hectares, in area, nearly 1.6 km from North to South and 1.2 km wide at the centre and a plateau 91 metres, above sea level. 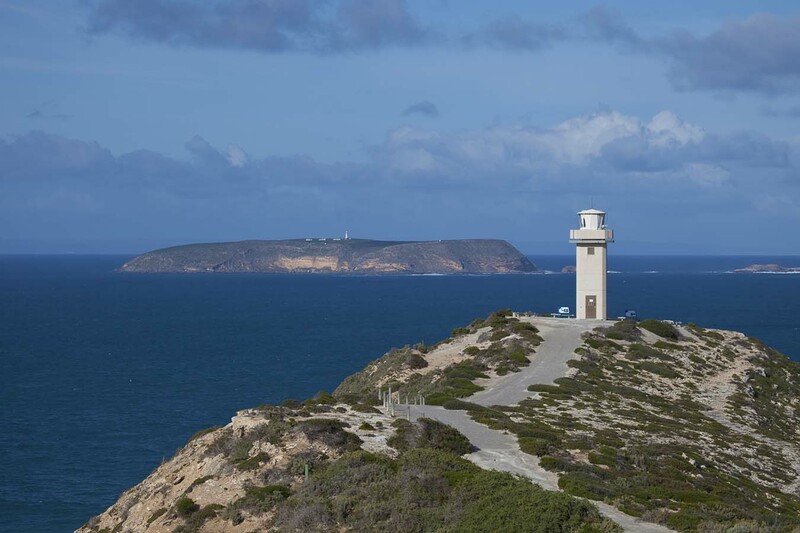 Reaching the summit is not only an achievement but breathtaking views of Lower Yorke Peninsula with Cape Spencer being the most southerly, 4.5 nautical miles (8 km) from Althorpe Island. 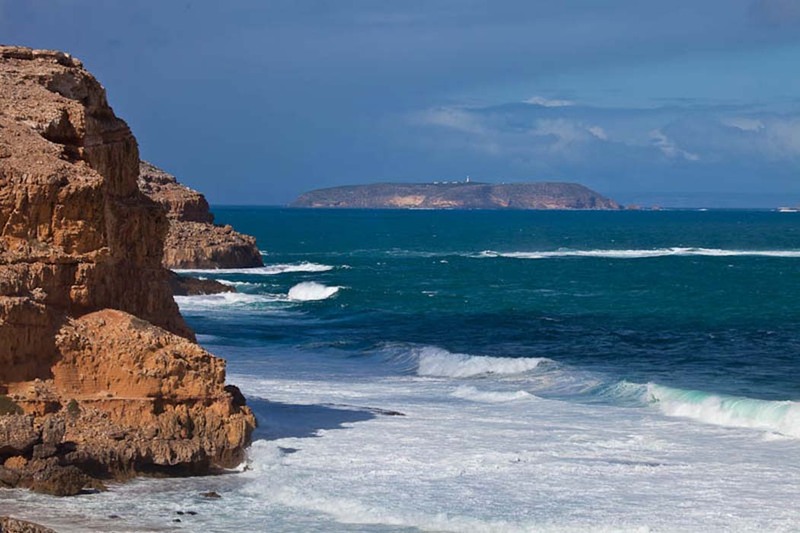 The view south is Kangaroo Island and looking west, visitors would note Wedge Island, with Port Lincoln 32 nautical miles further west. To the east, the vast sea horizon of Investigator Strait, where today, Adelaide’s loom can be seen. The lightstation is accessible by helicopter since the zig-zag track was closed by National Parks. The tower is not open to the public. Althorpe Island Lighthouse Station was one of a group of lighthouses that represented the inter-colonial agreement by the States in 1873, which sought the necessity of provisions for lighthouses. Construction began in early 1877 and after a party of dignitaries from the Marine Board arrived on Althorpe Island during the morning on Friday, 14 February 1879, during which time they had inspected the jetty, the bridge to the ‘cutting’ the steep inclined tramway, three cottages and finally, the lighthouse itself. The President of the Marine Board “emphatically declared it to be a model station”, with a £11,000 price tag, of which £1,500 was for water supply (the total cost was equivalent to one labourers wage for 91 years). Construction was not without incident, including the loss of the attendant cutter, ‘Young St George’, industrial disputation and the strange death of the foreman, killed by a falling rock while sleeping. The lighthouse was designed by R P Hickson, Engineer-in-Chief for South Australian harbours and jetties. The lighthouse was constructed with a combination of limestone and hard sandstone, for hard wearing areas, quarried and cut on the island. The spiral staircase is made of solid blocks of sandstone, treads faced with Mintaro slate. The three Keepers’ Cottages were constructed with rendered limestone rubble and hard sandstone for hard wearing areas. Water supply was from rain water held in tanks in the foundations of the tower. From 14 February 1879, or for the next 112 years, lightkeepers and families maintained the 15 metre tower warning mariners from a height of 91 metres above sea level, casting a beam 24 nautical miles into Investigator Strait. With the newly established Althorpe Island Lightstation and Cape Borda (1858) to its south, the warning beams provided important nautical links at the western end of Investigator Strait. Whilst travelling from the southeast, Cape Jaffa (1872) guided mariners along the treacherous coastline and `Sturt Light’ (Cape Willoughby) (1852), marked the narrow waters of `Backstairs Passage’. Troubridge Island Lighthouse Station (1856), indicated the Gulf of St Vincents entrance and further north, were the Port Adelaide lights, undoubtedly being a welcoming sight for the weary sea traveller. Despite the nightly illumination of 16 rotating light beams during the 112 years, six ships foundered around the island, some of which are commemorated with graves. The first shipwreck was in 1877 and the last in 1982, with the SS Pareora in 1919, sinking with the loss of 11 crew. Althorpe was powered by oil/wick; acetylene gas the vapourised kerosene/mantle until the light was converted to electric in 1963. Solar conversion took place in 1991. Lighthouse logbooks record some of the difficult island lifestyle experienced by keepers and their families, interluded with comments of wonder and beauty of the island, being shared with an array of coastal birds, including the seasonally estimated 22,000 shearwaters (mutton birds). Life was tough, but improved over the years with construction of the 72 metre jetty and the flying fox. Towards the end heavy supplies being brought in by ships such as the ‘Cape Don’ and light supplies such as groceries and mails by light aircraft on the 450 metre airstrip. During the early years of occupation with no direct communication with the Mainland, one keeper was ill for eight months. It took that time to hail a Government vessel on its way to Wallaroo to call and transport the sick man to Adelaide. In the meantime, the headkeeper (as stated in his Log would “put him in a warm bath and give him caster oil which mightily relieved him”. After the Russian scare, a telephone line was laid from Yorketown to Cape Spencer from where a heavy duty cable undersea to Althorpe Island, a distance of 58 miles. A great achievement within the 10 years of the invention of the telephone the line was subject to breakage due to the rocky seabed. Despite the hardships, the lighting of the warning beam continued faithfully each night. The jetty area also contains three grave sites. Prior to Commonwealth authority over lighthouses in Australia in 1915, operational management was first controlled by South Australia’s maritime authorities, ‘Trinity House’, succeeded by the ‘Marine Board of SA’. Since 1915 various Federal government departments were responsible for Althorpe Island Lightstation until automation of the light in 1991. During this time, the infrastructure was divided with the light tower and lead light being retained by the Australian Maritime Safety Authority. 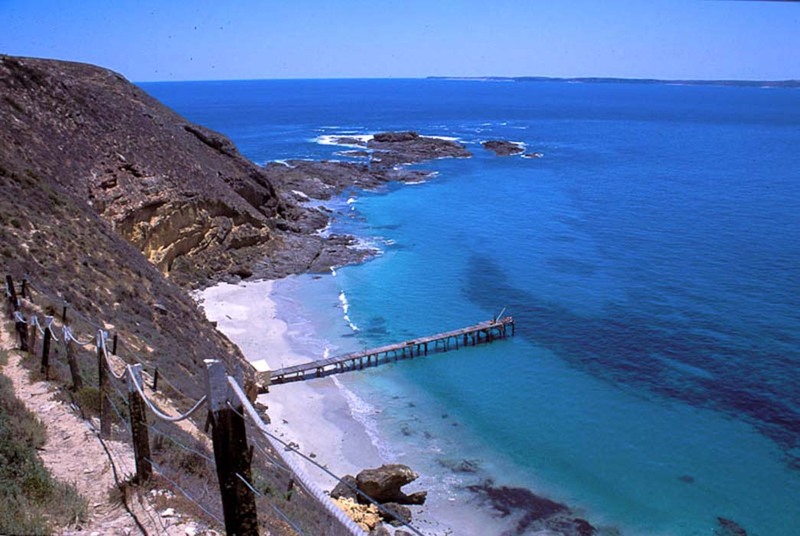 The 91 hectare island, which included the ‘heritage listed’ cottages, jetty and Australia’s only island flying fox was sold to the South Australia government and declared a conservation park in 1996. 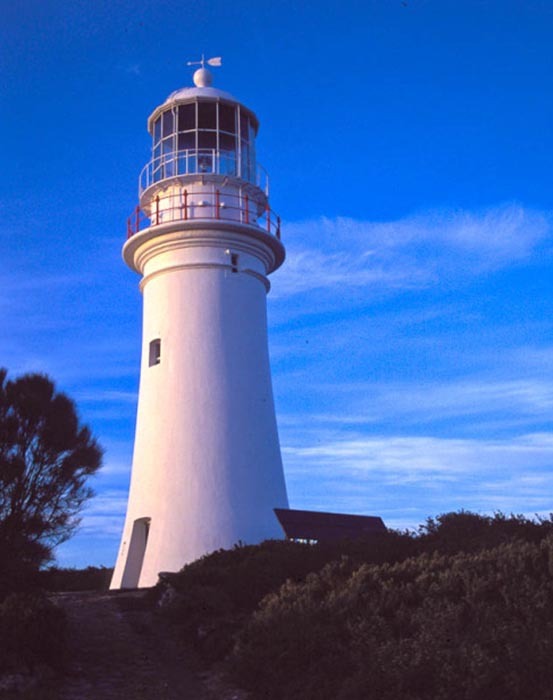 The Friends of Althorpe Islands Conservation Park’s newsletter, ‘The Althorpe Island Sentinel‘, keeps its members informed and as witnessed by the 100 annual visitors, this unique lighthouse station represents a living example of maritime history, at 125 years old on 14 February 2004.